The time has come….sadly we are losing huge numbers of migratory shorebirds as they head off on their journey north. It is a sad and a happy time for us all here as they head off to the northern hemisphere. They need to go north to breed and we will anxiously await the return of the adults and the juveniles later in the year. It is an exciting time, but a worrying time, as they head north in search of food on their stopovers in Asian countries. Each year the mudflats will change and they are faced with new challenges in their search for food before they continue on their northward journey to the arctic. They will travel to highly populated areas and then to the remote far north and each and every journey is incredible. 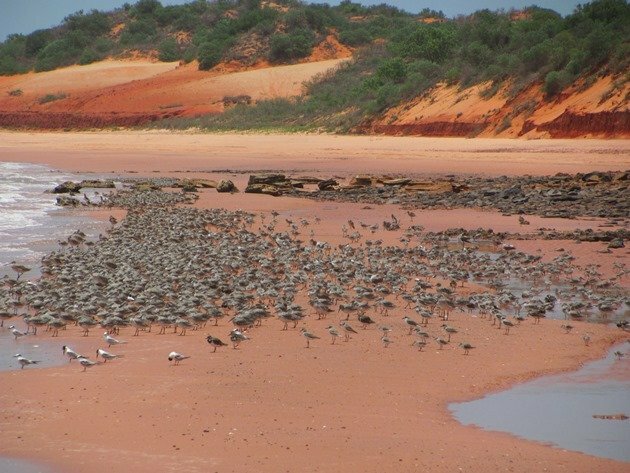 The migratory shorebirds leaving Broome vary in size from the tiny Red-necked Stint to the large Eastern Curlew. 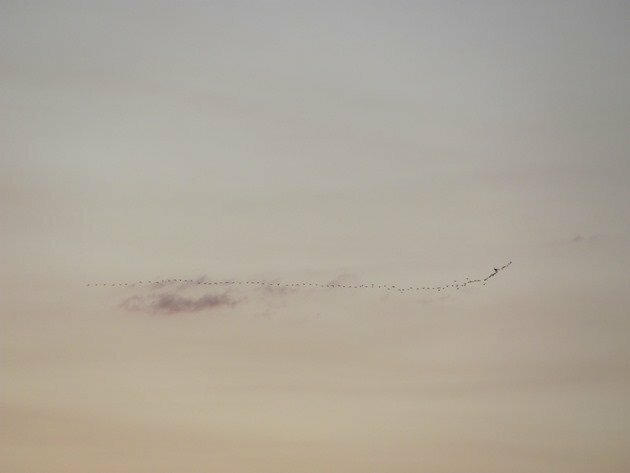 They will leave on dusk over the coming weeks and rise up from the mudflats of Roebuck Bay and form a V formation and head off on their northward journey. 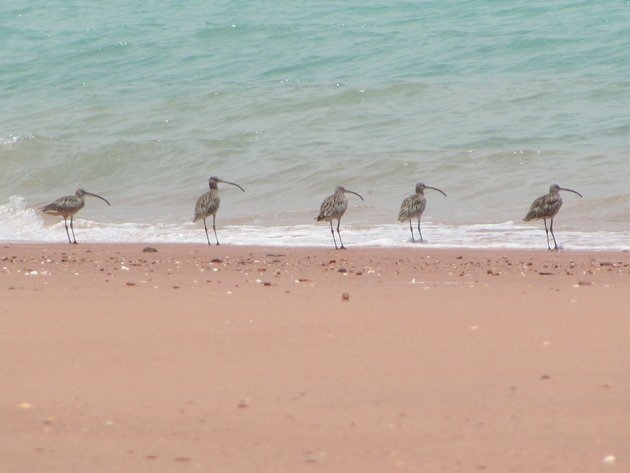 There are a variety of websites to the north of Broome where people can upload their photographs of individually marked birds as they make a stopover on their journey. Some of the migratory shorebirds will make a stopover in the Mai Po Nature Reserve and the Deep Bay area of Hong Kong, China. Everyone is encouraged to report any of the migratory shorebirds that they observe that are carrying individual markings onto a website. There is a coordinator that makes contact with the banders in the overseas countries and then the information on the individual bird is posted online. In Taiwan there are also migratory shorebirds passing through and they also upload photographs of individually marked birds on their website and detail the history of the birds. Another useful website in China is here. There are a wide variety of different combinations in the way that shorebirds are individually marked and there is a very useful guide that can be printed off and taken into the field from this website. Ideally a photograph is the best way to document your observation, but it is not necessary if you make clear notes on the positioning of the metal band and the flags. In the past there has been a lot of research done using satellite tracking to find out the exact routes that a variety of larger migratory shorebirds take and there were some amazing discoveries made. It was discovered that a Bar-tailed Godwit could fly over 10,000kms non-stop! You have to have a lot of respect for all migratory birds when you imagine the lives they live and the incredible journeys they make to enable them to breed and to continue to survive in a changing world. There are also many migration routes that would be unknown without modern technology and population density of endangered birds. With the aid of solar panel and a battery a 5 gram tag can be fitted to a bird and the information gained will enable the researchers to follow the species as it makes its journey through remote areas. The Sociable Lapwing Project was first started about 4 years ago and these birds are travelling in an area not easily accessed and without this research very little would be known of their migration routes. In the UK they lost over 50% of their Cuckoo population in 25 years and realised how little was known of their migration. There was a recovery of a banded bird in Cameroon in winter over 82 years before the project started, but beyond that no-one knew anything about their migration route. Once again these tiny 5 gram satellite tags were deployed and since 2011 they have tracked the incredible journeys of several Cuckoos. Recently a satellite tag began emitting information after 3 months due to the fact that the bird had not been receiving enough sunlight to its tag to send the information. The routes that the Cuckoos have taken each year have varied due to changing environmental conditions in Africa. One particular Cuckoo “Chris” is on the third trip to Africa and back now and he has chosen different places to visit each year. He even had a fortnight in France on his way back to the UK last year and I think we can probably assume he may have had some reproductive success on his way back to the UK! Last year Germany and Belarus also attached some satellite tags to some of the Cuckoos in their respective countries and all of their journeys are available in one place. In the USA Project Snowstorm has been able to get underway at very short notice to discover the movements of Snowy Owls. With thanks to the donations from the general public they have been able to attach tags to the Snowy Owls and these tags will not only show latitude and longitude, but also altitude. They are also solar powered, but rather than rely on satellites they will use the cellular phone network. If the birds leave an area covered by the phone network the information can be stored until they return to an area that is covered by the network, even if it is not for several years. Migration is an amazing occurrence that happens throughout the year. It is truly remarkable and it is happening right here in Broome with our migratory shorebirds and all across the world with a huge variety of species.